The South Napa earthquake that occurred on August 24 was on everyone's mind as the Third International Conference on Earthquake Early Warning convened last week in Berkeley. The meeting was a powerful show of scientific and political momentum as California prepares to lead the United States into a brave new world in which we'll get second-by-second countdowns in advance of dangerous earthquake shaking. Lieutenant Governor Gavin Newsom assured the conference that the money for the early-warning system will come: "It's a political question, not a financial question." "Early warning" is not a prediction of an earthquake, but rather an instant notification that an earthquake has started and shaking is on its way. Several nations have early-warning systems in place, and California scientists have been working on an American version on a shoestring of funding. Today they're ready to roll with a plan based on ShakeAlert, a beta-tested system that includes a smartphone app. On August 24, an alert reached the phone of beta tester Richard Allen, head of UC Berkeley's Seismological Laboratory. Because he was in Southern California at the time, the app awakened him at 3:20 a.m. with a series of alarm tones and a male voice calmly saying that "no shaking will arrive in approximately 200 seconds." 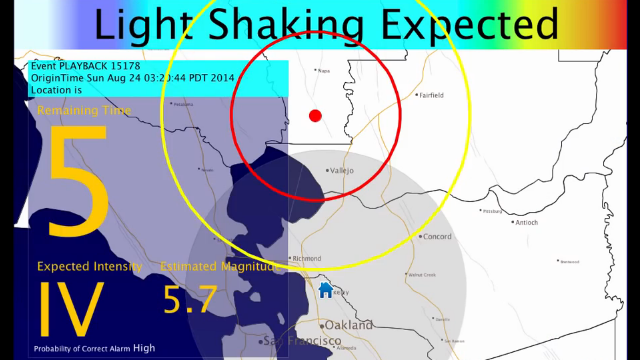 But at Berkeley, the app said that light shaking would arrive in 5 secondsand so it did. After more then two years of testing, California is ready to turn this beta into a prototype, then a rollout for a lot of people who are eager to use ShakeAlert for realfirefighters and other emergency responders, managers of large buildings and critical facilities, computer admins and earthquake geeks. Experts from other countries are eager to share their knowledge with us. All of those people were represented at the three-day conference, where they'd gathered to see and discuss the future. The mechanics of ShakeAlert are ready to go. The U.S. Geological Survey, which has funded this line of research for over 20 years, published Open-File Report 2014-1097 in May, a detailed plan to complete the system. USGS representatives explained that this plan constitutes a pledge to build it when the money, about $80 million over five years, is in hand. It will look pretty much like the beta version, although researchers will continue to refine every part of it during implementation. The benefits of even a few seconds' warning are considerable. For instance, the BART system is already using the ShakeAlert beta. BART Director John McPartland said that if the Napa quake had occurred during service hours, railcars would have automatically slowed from 70 mph to 40 and from 30 mph to a stop, essentially eliminating the possibility of crippling derailments. Another speaker said that the cost of statewide ShakeAlert could be met by reducing economic losses less than one-half percent. Just avoiding a fraction of the inevitable building fires would suffice: this is why Japanese earthquake drills instruct people, if they have a few seconds before "drop, cover and hold," to put out any open flames. The state law that committed California to building the early-warning system did not include funding, but state senator Alex Padilla, who sponsored that law, said that between various state accounts and contributions from federal agencies and large private companies, the money will come. Funding from the Gordon and Betty Moore Foundation, which supported the ShakeAlert beta, will continue. And the federal budget for next year includes $5 million in new money for the ShakeAlert network, in both the House and Senate versions, no mean achievement for today's Congress. The idea is for ShakeAlert to start in California and then expand, first to Oregon and Washington, then to the entire nation. At the same time, an ecosystem of businesses, from insurers to consultants, will find new ways to offer value from ShakeAlert's output. California is a natural leader in early warning, the USGS's Douglas Given explained, because California alone accounts for two-thirds of America's annual earthquake losses. Yet most of the country experiences earthquakesconsider that the magnitude-5.8 Virginia earthquake of August 23, 2011 was felt by something like 50 million people. And the recent rash of shakers triggered by deep injection wells has turned Oklahoma into earthquake country. Early-warning experts from other countries reported their advances. In Japan, a new algorithm called PLUM (Propagation of Local Undamped Motion) will avoid the false alarms that were issued for aftershocks of the 2011 quake. Japanese researchers are also working on a special set of alarms for people in high-rise buildings, which react in outsized ways to low-frequency shaking. In Europe, a nationwide alert system has been operating in Switzerland for more than six months, and several other nations have limited systems. The alert system in Mexico, launched in 1991, has expanded beyond Mexico City to four other cities, and the SARMEX early-warning radio network, started in 2012, uses portable radios made by San Mateo-based AtHoc that are already certified for use in California. What's at the scientific frontier of the field? The Napa earthquake triggered its alert in just 5.1 seconds, and the La Habra quake of March 28 triggered its alert in 4.1 seconds. Researchers are working to make this even faster, and several poster presentations addressed ways to shave the time down through better hardware, more rapid data transmission and quicker recognition of seismic events. The aim is to reduce the "blind zone" near a quake's epicenter where today's alarms come too late to matter. Scientists have recognized that the largest earthquakes expose weaknesses in their traditional approach, which relies on seismometer data to first determine the center and the size of an earthquake and then forecast where its energy will go. High-rate location data from GPS receivers, image-recognition techniques and quick-acting Bayesian logic are leading the next wave. And for an example of crowdsourced approaches, we heard from UC Berkeley's Qingkai Kong about his MyShake app, which turns people's smartphones into a seismic network that could be used anywhere in the world, not just in wealthy countries. I have a lot more to talk about from the meeting, so please ask your questions in the comments. Meanwhile, here are some more links worth following.